Dave Evered, a Hamilton factory worker, pushed callused and grease-streaked hands into the palms of five sons. “Do better, boys,” he implored. “I’m sad to be stepping away from this incredible opportunity to serve,” says outgoing UFV President Mark Evered. 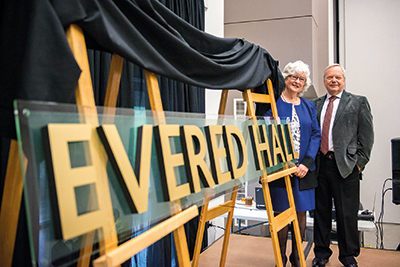 Gregarious, patient, and ever-present, Dr. Evered might be remembered as a people’s president — but what he built, literally and figuratively, leaves a timeless legacy. 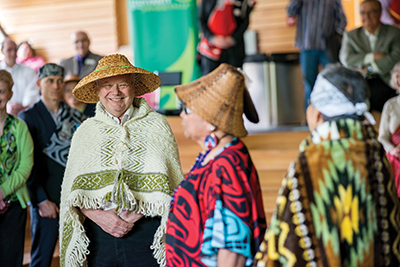 He retires June 30, eight years after taking the helm, shortly after UFV gained university status. The recession triggered financial challenges, but by leveraging non-traditional donors, goodwill, and partnerships with communities and businesses, Evered found ways to build. 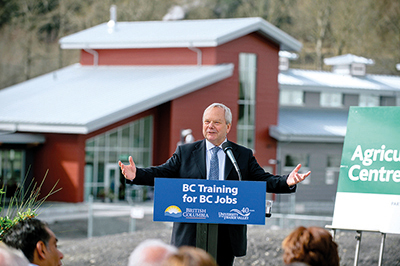 He helped steer UFV’s Chilliwack campus onto the Canada Education Park with its new, internationally acclaimed 150,000-square-foot teaching and research building and its celebrated Agriculture Centre of Excellence. UFV’s urban presence evolved with downtown locations in Abbotsford and Chilliwack and the Graphic + Digital Design program in Mission. In Abbotsford, students moved into their new Student Union Building. Transportation between campuses even got a boost with the new morning-to-evening shuttle service. “I’ve had the advantage of working with an outstanding team of innovative and hard-working senior administrators,” says Evered. He is quick to deny credit for any achievements, pointing out examples where nothing would have happened without the commitment and talents of his team, faculty, and staff. Evered also points to the many volunteers so vital to UFV’s success. “I’m so grateful for the outstanding Board members, especially the Chairs and the Chancellors who’ve guided and supported me,” he says. A first-generation learner from a working class family, Evered’s climb wasn’t easy or obvious. His father left school to work after Grade 7, his mother Marjory after Grade 10, and the family was not wealthy. “The odds of me going to university were slim,” Evered recalls. 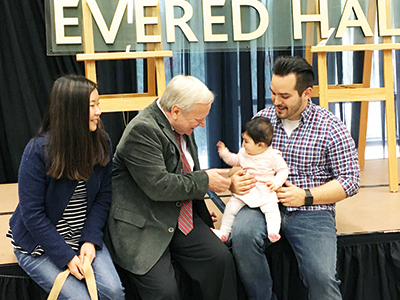 Evered launched his post-secondary education with a BSc in biology from Hamilton’s McMaster University, then earned a PhD in neurophysiology from the University of Western Ontario. He has held teaching, research, and administrative appointments at Cambridge University, the University of Western Ontario, the Florey Institute of Neuroscience and Mental Health in Melbourne, the University of Saskatchewan, and Thompson Rivers University. He’s an award-winning teacher and his research has been published in leading journals. All thanks to hard work — and the generosity of parents who lost a son far too early. Mark and Maureen married during his first year at McMaster and their first daughter, Lisa, was born that summer. Only 19, Mark knew he had to provide. Books and tuition took a backseat to dinner and diapers. A bursary helped clear the trail. When McMaster student Eric Schlichting died tragically young in a car accident, his friends and family created a memorial bursary. Being the recipient of this gave Evered the funds to continue, but just as importantly it delivered a message of hope and trust. Inspired by that gift, the Evereds have responded to their own family losses in a similar way. First came the David and Marjory Evered Memorial Endowment. Then, after the tragic death of their beloved middle daughter, the Andrea Christine Evered (ACE) Tardij Memorial Endowment Leadership Award. “To see that her name and passion for early childhood education would inspire and support others,” Evered explains. “This is our way of giving back, by paying forward. I am convinced that education is the best investment we can make in our future. That’s why I do what I do. Evered saw many new programs created during his tenure. His team also guided academic restructuring such as the creation of the Faculty of Health Sciences, promoted integration of technical and academic programs, and expanded student support services, athletics, and recreation. 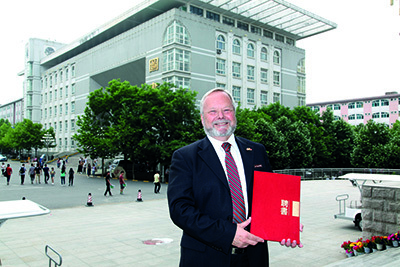 He also championed the development of a vibrant Alumni Association. The number of credentials awarded at Convocation grew by about 50 percent between when he started in 2009 and now. UFV now serves over 15,000 students and the operating budget has risen from $79.5 million to over $127 million. UFV has also been recognized as a top employer and inclusive workplace, and been ranked highly for the quality of education, student success, and student/faculty satisfaction. Evered’s steadfast work on behalf of students will continue. He points to the strategies in the UFV 2025 plan, to the Institutional Learning Outcomes blueprint, and the Strategic Enrolment Management plan. He is proud of his team’s sound management of UFV finances, buildings, and facilities, its principle-based governance structures, and the many innovations in teaching and learning and student support that are taking place throughout the university. Evered also takes pride in the growing numbers of Aboriginal students and partnerships with Aboriginal communities and the university’s commitment to reconciliation. He notes how international partnerships are enriching UFV programs, too, bringing the world to the Fraser Valley and the Valley to the world. These and the growing number of practicum and co-op opportunities are giving students a real-world education. Evered believes that the foundation of UFV is strong but more work lies ahead. “Globalization, technology, the changing nature of work and changes in the expectations of employers, students, and communities are challenging the traditions of colleges and universities,” he says. His successor will need plenty of energy and stamina. 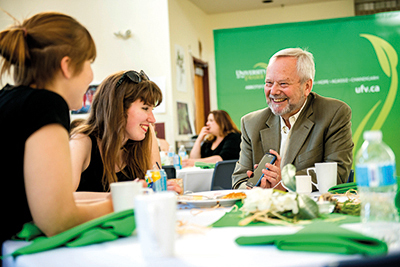 Workdays, evenings, and weekends are packed for UFV’s president. It wasn’t unusual to find Evered, fresh off an international flight, heading straight into a meeting or community presentation, highlighting the work of others while reminding all of the long road ahead. Often by his side is Maureen, the love of his life and co-host for countless events and dinners served at Friesen House, UFV’s on-campus presidential accommodation. And their grandkids especially love that Grampa has woods, ponds, and a Tim Hortons in his backyard. 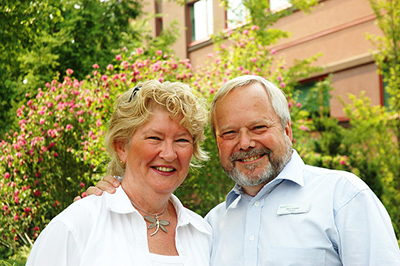 The Evereds have enjoyed their time here so much that they’re becoming the first UFV presidential couple to retire in the Valley. “It’s a lovely place. Beautiful valley, wonderful climate, and great friends. I’m especially excited about having the time to help in the community, in ways that I couldn’t as president,” Mark says, reflecting on his wild schedule of the past eight years. Evered has also agreed to help with the transition of the next president. 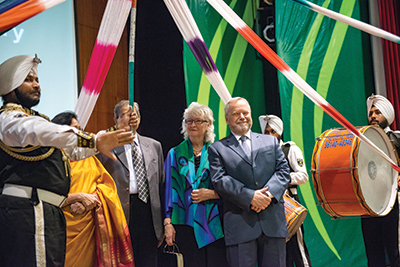 Evered also plans to help with some projects at UFV’s Chandigarh campus in India, and he’s been invited to collaborate with colleagues at Xi’an Fanyi University, a school in China that made him honorary president two years ago. He is also exploring some teaching and research opportunities with his UFV colleagues in Kinesiology. While looking forward to new ventures, Evered also reflects on the past.